State Agriculture Commissioner Richard A. 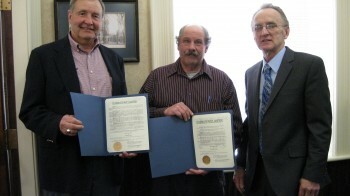 Ball today congratulated Dueppengiesser Dairy Farm, located in Perry, Wyoming County, as the recipient of the 2017 Agricultural Environmental Management Award. Each year, the award honors the outstanding efforts of a New York State farm to protect and preserve soil and water quality. 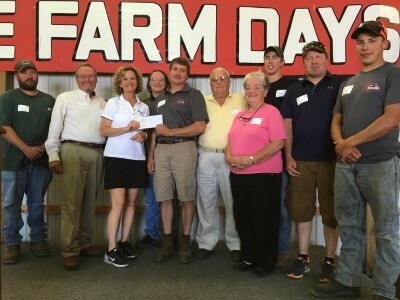 Dueppengiesser Dairy Farm was recognized today, along with the Wyoming County Soil and Water Conservation District, during a ceremony at Empire Farm Days in Seneca Falls. The New York State Department of Agriculture and Markets, the Empire State Potato Growers, and the American Agriculturist Magazine presented the award to the family for their implementation of conservation best management practices that benefit the environment and protect the community. Dueppengiesser Dairy Farm is a third-generation family farm that manages nearly 2,000 milking cows and youngstock and operates more than 2,000 acres of cropland, producing corn, alfalfa and wheat. As early adopters of the principles of AEM, the family has implemented several practices, such as reduced tillage, use of cover crops, and nutrient management, to protect soil and water quality. The family is also very active in the community, hosting several agricultural education programs on their farm, including the Farm Bureau School Education Program, Agri-Palooza and the Western New York Soil Health Field Day. The farm has worked closely with the Wyoming County Soil and Water Conservation District, which provides technical assistance to advance agricultural environmental management practices within the county. The Wyoming County Soil and Water Conservation District has a very active agricultural environmental management program that has assisted over 361 farms since its inception. Their AEM Strategic Plan focuses on nutrient management and reducing cropland erosion, and Dueppengiesser Dairy Company has implemented various practices to address these issues that will improve soil health and protect water quality. New York State’s agricultural environmental management framework is a model for the nation as a voluntary, incentive-based approach to protect natural resources and meet the economic needs of the agricultural community.